The Washington Wizards are one of the best teams in the Eastern conference this season, led by John Wall as he continues to establish his place among the league’s best point guards. The New York Knicks? At the moment they’re maybe even worse than the Philadelphia 76ers. Much will be said when this season is over about how badly the Knicks have fallen from a team that made the conference semifinals in 2013, to narrowly missing the playoffs a year later and into the bottom of the heap under the first year guidance of Phil Jackson and Derek Fisher. Carmelo Anthony signed a massive extension but right now seems better off being shut down than carrying on playing for a team that’s going nowhere. However, Anthony hasn’t missed too much. He’s averaging 23.7 points per game and even shooting a very decent 45.8% from the field. But the triangle offense isn’t working for this group, ranked in the bottom 10 of the league when it comes to offensive efficiency and fourth from last in defensive efficiency. J.R. Smith and Amare Stoudemire not playing in the Christmas opener might be another bad sign as bad losses at the MSG are quite common these days. 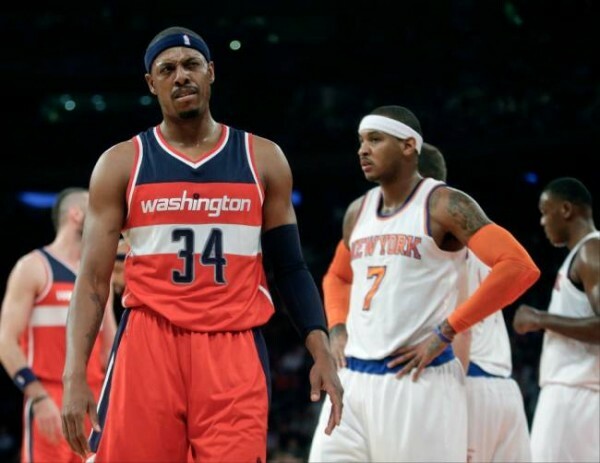 For the Wizards, the Knicks are an opportunity to bounce back after losing at home to the Chicago Bulls, a team the Wizards are a bit more concerned with matching up against than the Knicks. They’d be quite pleased about handing the Knicks their 16th lost in 17 games and an eighth consecutive loss at home, something that hasn’t happened in New York since the crossover between seasons in 1985. The Wizards have lost two in a row, and have a losing streak of their own to avoid, which should be on their minds considering the close race for the top spots in the Eastern conference right now. The Wizards shot below 43% from the field in both their losses at home following a six-game winning streak in which they were slightly better than 50% from the field and averaging 105.8 points per game. They are fourth in the NBA in defensive efficiency, allowing 99.7 points per 100 possessions. This is the second meeting between the teams this season. The Wizards had no problem in New York the previous time, winning 98-83 behind 17 points from Paul Pierce and Garrett Temple. Anthony scored 18 points for the Knicks, but shot only 8-of-23 from the field.